Joan Miro experimented with the use of simple, exposed lines in his compositions. He held a particular reverence for the sun, moon, and stars, which determined the day and night, the light and absence of light, in our everyday lives. Though he was interested in the modernism of skyscrapers and man-made structures, he was fascinated by the drawings of cave men and human ancestors and their artistic responses to the power of the natural world. 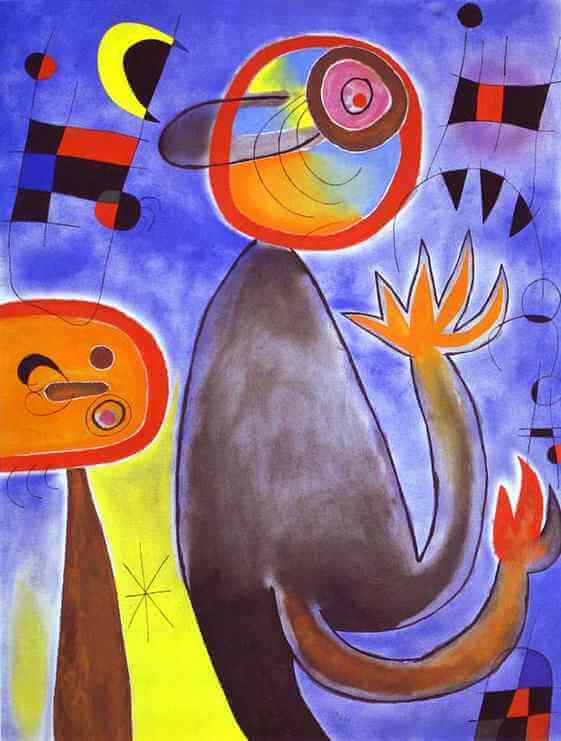 In this painting Miro shows the world of his images in a very cheerful vein. Hovering in the top half of the picture, there are his usual escape ladders leading into heaven - symbols of the artist's relationship with the powers of creation. In the middle there is a large grey figure which that seems to be grasping at the ladders. Two enormous claws are bent upwards, and the animal-like face is turned towards the other figure on the left, whose head is balanced on a pointed pole. This nocturnal painting shows a cheerfully musical and easy-going playfulness.